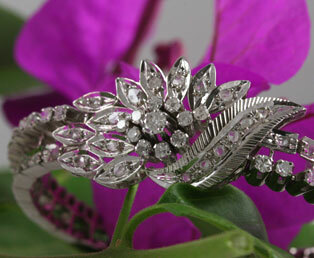 This Art Deco early 1900s diamond bracelet is designed as a stylized floral design. This estate diamond bracelet is designed to represent a very modern flower with long engraved diamond leaves. At the center of this bracelet, is an old European cut diamond surrounded by eight bright, fiery round diamonds. This glamorous Art Deco diamond bracelet is laden with appx 3.48 total carats of diamonds. Crafted in 14kt white gold. One round European-Cut diamond of appx 0.20 carat, clarity grade - I1, color grade J. 64 rose-cut diamonds of appx 1.28 ct tw, clarity grade - SI1-SI2, color grade I,J. Measures: length 8 inches long. 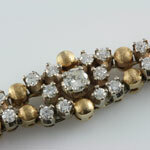 The center design of this diamond bracelet measures 1.5 inch x 1 inch. These products may also interest you.